This 7 by 9 foot area in the Science Center Plaza designates the allocation of space given to those in solitary confinement in many penitentiaries. The space served as the site of a 23 hour long vigil between Tuesday and Wednesday in protest of current justice system policies. 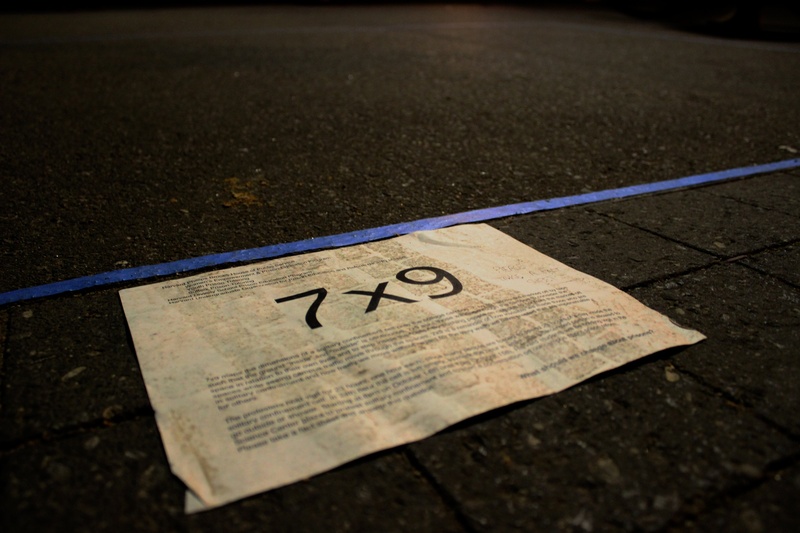 UPDATED: October 19, 2014, at 1:05 p.m.
Past midnight on Wednesday morning, Rachel P. Thompson ’16 sat outside the Science Center with nothing but an empty square of blue tape pasted on the ground behind her. “What would you do to change the prison system?” asked the hand-drawn sign on an easel in front of her. 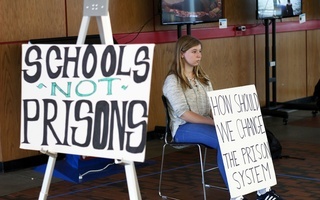 From 9 p.m. on Tuesday until 8:00 p.m. on Wednesday, Thompson and around 20 other students took shifts sitting beside a seven-by-nine-foot box, which represented a prison cell, as part of a vigil for prisoners held in solitary confinement. The student vigil, which was called 7x9, lasted for over 22 hours, including the few hours demonstrators were forced to move inside the Science Center beginning at 1:00 a.m. to avoid paying for security on the plaza. 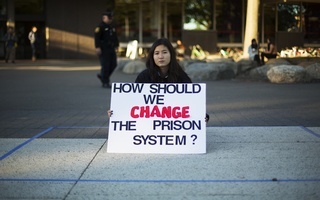 The box was designed to mirror the size of the average solitary cell, according to Student Alliance for Prison Reform, a national network of college students that aims to raise awareness and public discourse on prison conditions. The movement began at Princeton, and seven other campuses participated in the event Wednesday. Unlike demonstrations at other colleges, Harvard’s vigil featured student protesters giving information about life in solitary confinement. Protest leader Eva Shang ’17 stressed the importance of Harvard students learning more about issues of prison life and solitary confinement. Shang also cited that nearly 50 percent of prison suicides occur among the 4 percent of the U.S. prison population currently in solitary confinement. “It’s absolutely inhumane and should violate our basic human sensibilities,” Shang said. Both Thompson and Shang have worked with prisoners in the Cambridge community through educational programs and said they tried to leverage their experiences when planning the demonstration. Supermax prisons, which are designed to hold prisoners in prolonged and strict solitary confinement, are ineffective, expensive, and detrimental to mental health, surgeon and journalist Atul Gawande said during a speech at Harvard Law School yesterday.